What a deal! Two free packs of Slinkys when you buy 10. Gauges 10-13-17-26-36-46. Ernie Ball 2221 Slinky Electric Guitar Strings feature nickel-plated steel wire wrapped around tin-plated, hex-shaped, steel core wire. Slinkys provide vibrant, bright, lasting tone and reduce fret wear. This weight balances maximum response from your pickups with playability and bendability. Ernie Ball replacement strings are precision manufactured to the highest standards and most exacting specs to assure consistency, optimum performance, and long life. Jimmy Page, Eric Clapton, Steve Vai, and Slash are among the long list of Ernie Ball Slinky players. Nickel-plated steel wire wrapped around tin-plated hex-shaped steel core wire provides vibrant, bright, lasting tone and reduces fret wear. Fret Zealot is a state-of-the-art LED addition to your guitar. It fits just above the frets and shows you exactly where to put your fingers to play anything you can imagine… in any color! Everyone wants to learn guitar, but few succeed. Fret Zealot pushes the gas pedal on learning and puts you in control of your musical experience. Replace frustration with fun and learn guitar on YOUR own guitar. The Fret Zealot app introduces intuitive learning with an impressive suite of features that’s continuously being improved and updated to make the best guitar learning environment on the market! It lets you learn quickly and intuitively without the constant distraction of looking at books, videos, or sheet music to find out where to put your fingers. You can concentrate on technique and finding your style right from the start. Fret Zealot was perfected after 5 years of development. The design is meticulous and will not interfere with the strings or frets. It’s compatible with any full size guitar (scale length 24.75″ – 25.5″). The rechargeable battery lasts 12 hours and clips onto the head stock of any brand of guitar. The audio cable connector can swapped for a longer one to fit or mount anywhere if you don’t want to clip it to your head stock. Free iOS and Android app for control via Bluetooth. Want to see more? Check out the glowing reviews of Fret Zealot from Digital Trends and Inc Magazine. Learn to jam like the pros do with an acoustic guitar set perfect for beginning and experienced musicians. Complete with a guitar strap, digital E-tuner, and much more, this set has everything needed to start kickin’ tunes in no time! Its dreadnought body with cutaway design contribute to a quality, rich sound that caters to various styles of music. Utilize the included carrying bag to take the show on the road for gigs. Low action strings reduce hand fatigue and are easy on your fingers. This is ideal for beginners who are still building their hand and finger strength through practice! The set comes with everything to start playing right away, such as a guitar strap, guitar pick, and extra strings! Just put the digital clip-on tuner on the headstock for easy tuning. 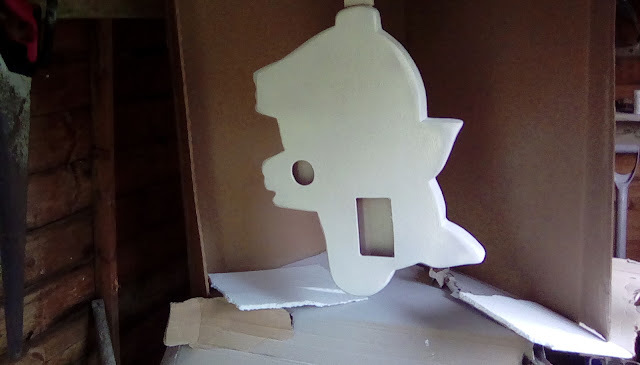 After much filling in and sanding, on Sunday I thought I was ready to begin spray painting. 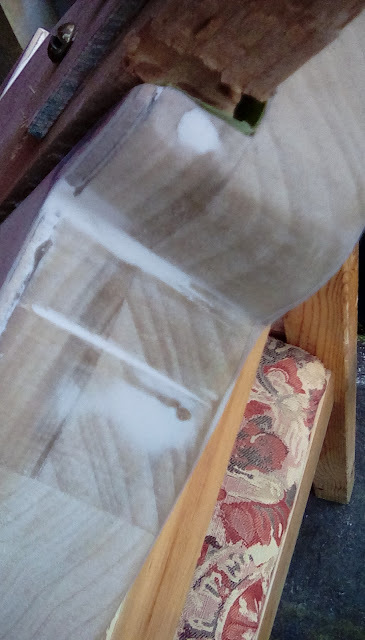 However, no sooner had I attached a piece of wood into the neck pocket to act as a handle and something to hang the guitar body from while spray painting, than I noticed a deep saw line on the side of the body near the neck pocket which I had somehow missed (see above photo). 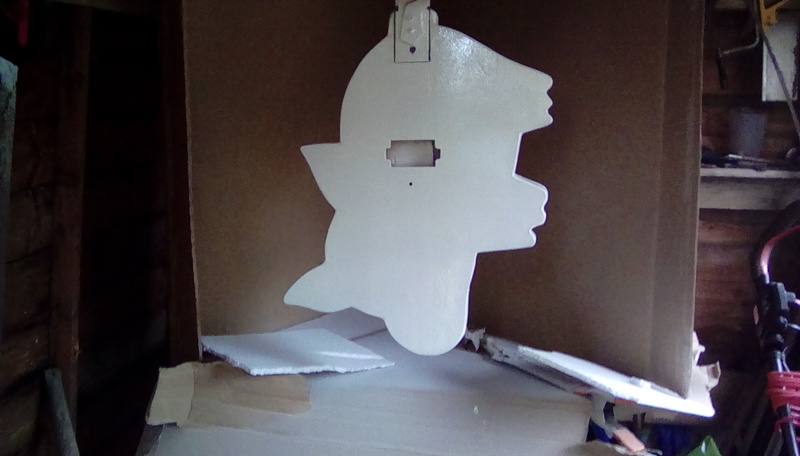 I had to fill it in with woodfiller and sand it back three times before I was happy with the smoothness of that area, but at last today – a couple of days later than intended – I was ready to begin spray painting. I’m using rattle cans for the whole finishing process, beginning here with a white primer. First coat done, front and back. 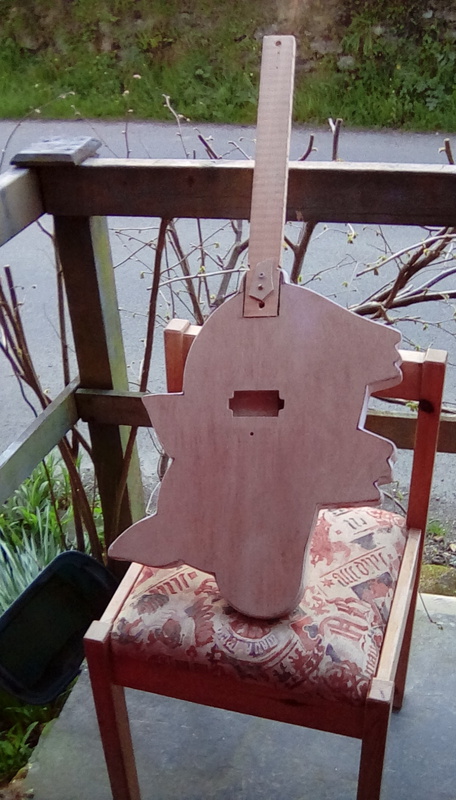 Having let it dry I noticed that the initial coat had brought up the grain in the plywood forming both front and back, so I sanded the whole thing again until getting a silky smooth finish and after cleaning away the dust I have re-sprayed. We’ll see what it looks like in the morning.